KOKOMO, Ind. 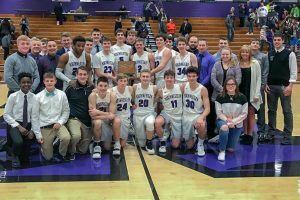 – The Northwestern boys basketball team continues to roll through nearly all-comers – including a clean slate in the Hoosier Conference. After going 4-0 during the regular campaign to claim the West Division title, Class 3A No. 5 Northwestern defeated West Lafayette 49-35 to claim the overall Hoosier Conference title. It is the second conference title in three years for the Tigers. In a defensive battle, Northwestern kept West Lafayette to under 35-percent shooting. The Red Devils entered the contest averaging more than 50 points per game. Despite being held to 49 points – which matched its lowest output of the season – the Tigers got off to a quick start, leading 17-9 after the first quarter and 29-16 at the break. The Red Devils cut the lead to 10 with three minutes left in the third quarter (45-35), only to see junior Tayson Parker score a quick four points to put the game out of reach. Parker finished with 29 points and now has 1,073 career points in just two varsity seasons with the Tigers. Cameron Austin added six points while Logan Bowser and Ben Harris had five points each. Harris had a team-high six rebounds. For West Lafayette, Yanni Karlaftis had 10 points and Nelson Mbongo added nine. Northwestern (19-1) has one more regular season test when they host Oak Hill on Feb. 19 at 7:30 p.m. 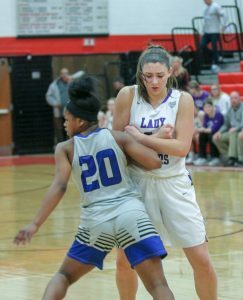 The Tigers will then set its sights on cutting down another net when it plays in the Frankfort Sectional at the historic Case Arena. Northwestern is 10-0 against 3A squads and 6-0 against the Sectional 20 field. They drew a bye and will play the winner of the Frankfort (2-19) and two-time defending sectional champion West Lafayette (12-9). KOKOMO, Ind. – With an 87-73 win over IU Southeast, the NAIA Division II No. 24-ranked IU Kokomo Cougars clinched the West Division of the River States Conference for the first time in program history. Clinching the top spot in the division ensures home court for the RSC Tourney with the first round being played at the Cougar Gym on Feb. 20. It was a big night for junior Antoin Clifton, who scored 18 points to become the third member of the Cougars 1,000 Point Club. Clifton also had six rebounds and one assist. Trequan Spivey led the Cougars on offense once again, contributing 27 points in the win after going 10 of 13 from the floor. Coming off the bench with a strong 10 minutes, Desean Hampton scored eight points, had seven rebounds and two assists. The 2018-19 River States Conference Men’s Basketball Championship bracket and qualifiers are in place after the end of the regular season. Eight teams will be vying for the conference title from Feb. 20-26 with the winner automatically qualifying for the NAIA Division II National Championship. It is a very strong RSC bracket with four teams from the NAIA Division II Top 25 Poll and four squads with 20 or more wins on the season. The championship begins with the quarterfinals on Feb. 20 followed by the semifinals on Feb. 23 and the finals on Feb. 26. WVU Tech, the No. 9 team in the country, is the No. 1 overall seed in the championship. It went all the way down to the final game, but the Golden Bears (26-4, 15-2 RSC) secured the RSC regular-season title and are guaranteed an automatic bid to nationals. The RSC East Division champs begin the playoffs by hosting No. 4 seed Brescia (Ky.) University (15-13, 11-7 RSC) from the RSC West. Asbury (Ky.) University (20-9, 13-5 RSC) reached the 20-win mark on the final game of the regular season to clinch the No. 2 seed out of the RSC West. The Eagles host University of Rio Grande (Ohio) (12-18, 6-11 RSC), the No. 3 seed from the RSC East. IU Kokomo, ranked No. 24 in the nation, won the RSC West Division title and the No. 1 seed in its half of the bracket. The Cougars (23-6, 13-5 RSC) host No. 4 seed Point Park (Pa.) University (9-17, 5-12 RSC) from the RSC East on Feb. 20 at 7:30 p.m.
IU East, the No. 13 team in the country and the RSC champion the last two years, is the No. 2 seed from the RSC East. 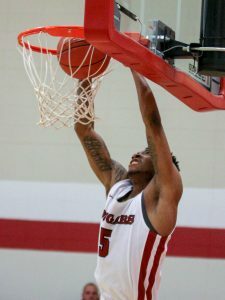 The Red Wolves (23-7, 15-2 RSC) also won 15 RSC games like WVU Tech but lost the tiebreaker. IU East hosts No. 3 seed IU Southeast (19-10, 12-6 RSC) of the RSC West. The Grenadiers are currently “receiving votes” toward the Top 25 poll. The 2018-19 River States Conference Women’s Basketball Championship qualifiers and bracket are set after the completion of the regular season. The eight-team championship will be held Feb. 20-26 at campus sites around the conference. IU Kokomo (17-10, 13-5 RSC) is the No. 2 seed from the RSC West and begins the championship hosting Point Park (Pa.) University (13-15, 9-8 RSC), the No. 3 seed from the RSC East on Feb. 20 at 5:30 p.m. at the Cougar Gym. The IU Kokomo-Point Park winner will face the WVU Tech-Midway winner in the semifinals.